That summer of 2005 John had been an intern at Quaker House in Fayetteville, North Carolina, where I was Director. When he applied for an internship, I asked him for a letter of reference; the reference came by email from Tom Fox, in Baghdad. John described in his application essay how he knew Tom, from work in a market that became part of Whole Foods. I had met Tom at Langley Hill Friends meeting in McLean, Virginia, where we were both members. I didn’t know him especially well, but his children were the same ages as my younger two, and the four of them grew up in that meeting, conspiring to torment a generation of First Day School teachers, on many a First Day morning. Tom was also very kind to me at some moments of personal need. Tom’s path to Iraq and a lonely death there was straightforward. We talked about it in August, 2005 when I saw him for the final time. It was at the annual sessions of Baltimore Yearly Meeting, our regional Quaker conference, in Harrisonburg Virginia. Spiritually, Baltimore Yearly Meeting had long been home to both of us. The body operates three summer camps, and Tom had been active with them, serving as cook at one. He had also been a “Friendly Adult Presence” (or FAP) with the yearly meeting’s youth group, even filling in as interim youth staffperson for a period. At the yearly meeting sessions, he frequently worked with the children’s program. 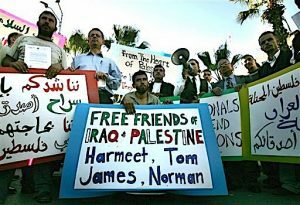 Indeed, if it had not been for his leading toward CPT and Iraq, any biography of Tom would have been much more about youth work than peace witness as such. When we met in Harrisonburg in 2005, Tom was between tours in Iraq, and we shared a meal and did some catching up. We talked first about kids, as older dads will do. His Andrew and Kassie, my Guli and Asa, are in their mid to late thirties now, scattered across the continent, but still in touch. 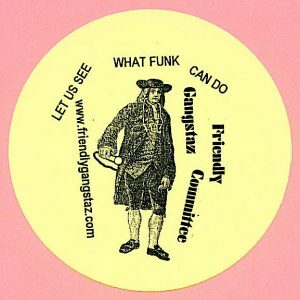 In the early 2000s, our sons started a Quaker Hip Hop group called the Friendly Gangstaz Committee. The band caused quite a stir in our small, staid Quaker world, with its startling, shouted renditions of well-worn hymns like “Simple Gifts.” Tom and I chuckled ruefully about that. How do you “pursue peace” in a violent world? My own seeking had led, after a series of conventional jobs, to Fayetteville and Quaker House, a long-standing peace project hard by Fort Bragg, one of the largest U.S. military bases. Tom in high school, Chattanooga, Tennessee, 1969. For young men like him in those years, the next stop was the military draft, and for many, combat in Vietnam. Tom had little money, but he was a fine clarinetist: he auditioned for the Marine band that played at the White House, and got in. The band was a non-combat unit. He sometimes came to Friends meeting in his uniform. Tom had grown up in Chattanooga, Tennessee, then did twenty years in the Marine Corps band in Washington DC, playing bass clarinet – about as unmilitary a soldier as one could feature. He began attending Friends meetings during this time. After the Marine band, he became a baker and assistant manager at a growing health food supermarket, where he met John Stephens. Tom was good at all this, and his bosses wanted him to move up in management. But Tom heard a “different drummer,” especially after September 11, 2001. With at least two wars on, he felt called to “pursue peace” in a concrete way. After much prayer and reflection, he joined the Christian Peacemaker Teams. CPT sets out to bring the “weapons of the spirit” into the front lines of conflict, places where death and life are but a hair’s breadth apart. Tom’s first assignment took him to Iraq. For a respite, he visited the Occupied Territories of Palestine. Work in Iraq was dangerous, in a region where conflicts seem hopelessly intractable. Tom stuck with it. Then, as the Iraq occupation shifted from the foolish illusion of “Mission Accomplished” presidential boasting to the grinding facts of guerrilla and civil war, he headed back there. 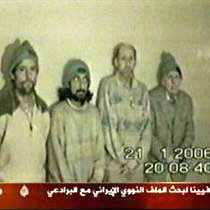 The four hostages, from Left; James Loney, Harmeet Sooden, Tom Fox & Norman Kember. What’s striking in this comment is not only the mean-spiritedness, but also the ignorance. Tom certainly knew the reality of Baghdad’s dangers, firsthand. He had talked frankly about them over our last August supper. Tom was calm but clear about it: kidnaping, torture, murder were daily fare on all sides there. 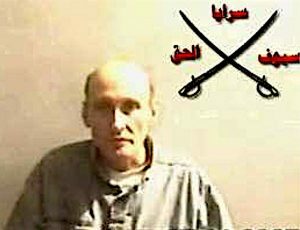 Tom, seen in a video released by his captors, early on in their captivity. In later videos he looked more haggard and drawn. How could he be so offhand about it? I don’t know, except to say: that was Tom. Illusions? Not in CPT. It was a CPT team, after all, that brought the first reports about the toerture and abuse at Abu Ghraib prison to reporter Seymour Hersh. They had also seen other unarmed humanitarian workers in Iraq kidnaped and some killed. But such quotations roll too easily off the tongue. When John Stephens called about the kidnaping, I wanted Tom and his colleagues released, safely, and NOW. But what, John and I asked each other, could we do to help free them? John was calling from home in Virginia, where he does web work as a consultant. We kept returning to this question over the next few days – and we were not the only ones – intensity was rising as a deadline for the captives’ execution approached. Experts in crisis situations advised informally that the best approach was to raise the prisoners’ public profile, and seek as much public outcry for their safety as possible. That would raise the political cost to the kidnapers of harming or killing them. There were no guarantees, we understood that. But it was an alternative to blind panic or paralysis. Talking this over with John on the evening of December 1, an idea surfaced: what about creating a website and an online petition calling for their release? 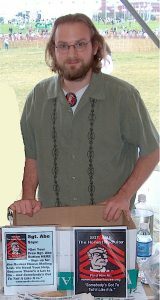 John’s experience as a webweaver, and such is the accessibility of the internet that within only two hours, he had a site, www.freethecaptivesnow.org up and running, with a petition and links to public statements calling for the release of the four captives. 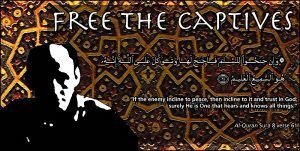 John Stephens designed and uploaded this banner and website in two hours aiming to join with an extraordinary international campaign to head off the hostages execution in early December, 2005, and then work for their release. For the first several days of December, there was a growing international chorus of such statements, even from very militant Muslim groups, supporting the CPT workers and their release. Our online petition, along with another, soon gathered more than 50,000 signatures from around the world. There were vigils and rallies. While we were terrified for our friends, the swelling response made this an exciting period. The deadline passed, but a video showed they were still alive. After December 8, when a second deadline for executing Tom and the others passed without killings, momentum shifted. The flurry of statements died down; news reports dwindled and became routine. From Baghdad there was ominous silence about our friends, amid the noise and cries of ongoing civil war. For John and me, at our website, frantic effort to beat a deadline was replaced by keeping a vigil. Every night for the next thirteen weeks, either John or I would scan dozens of wire service reports for news of Tom and the others, and post what we found: with only a few exceptions, the news was “no news,” which we hoped was “good news.” The exceptions were when gloomy videos of the four appeared – and then, on March 7, 2006 a video of just three – minus Tom. On March 10, 2006 came the dispatch we dreaded most: confirmation of Tom’s murder. (We were told that early reports he had been tortured were not confirmed by a later autopsy.) The only relief from this loss appeared on March 23, when the other three captives were freed by British commandos. Who killed Tom? And why? Few other than the ones who pulled the trigger know the truth, and one wonders how much even they understand. 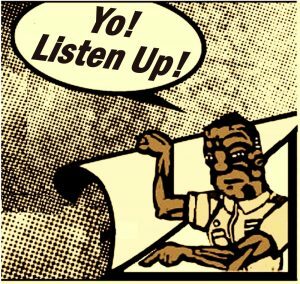 Speculation abounds, of course, with many of my more left-leaning friends imagining a CIA-sponsored conspiracy to silence these noisy pacifist dissenters. Yet from the reading and interviews I have done, the most likely guess seems much more mundanely sordid: it was probably all about money. 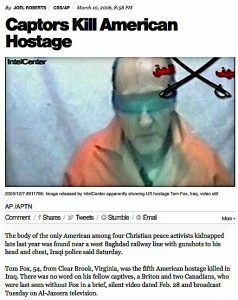 The videos showing Tom and the others were issued by a previously unknown group, “The Swords of Righteousness Brigades.” This name is very likely a fake, a cover for a criminal gang, which simply kidnaped them for ransom. There was, as John and I learned while keeping our vigil, a sizable kidnaping industry in Iraq. Many Iraqis have been thus abducted for profit, as well as citizens of numerous other countries. James Loney felt the ransom was wanted to help finance the guerilla insurgency. Many other observers feel that while the kidnapers are Muslims, and many have likely suffered from the invasion and occupation, these crimes appear to be only loosely connected to religious or political grievances. Rather, they are more a specimen of organized crime gangs mushrooming in a devastated and lawless society. Longtime relief worker Margaret Hassan, a good friend of the CPT tea members, was kidnaped in Baghdad in October 2004. Here she pleads for her life in a hostage video. She was murdered a few weeks later. Numerous humanitarian workers in Iraq were kidnapped, and several more were also killed. One, to show the friends and supporters of the other three that the kidnapers meant business. 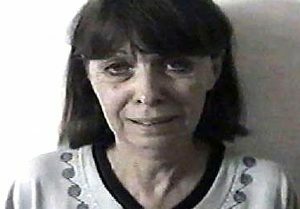 Some other hostage killings – for instance, that of longtime relief worker Margaret Hassan, an Iraqi citizen originally from Ireland – were evidently staged to show recalcitrant governments that ransom demands were truly life and death matters. Or two: because Tom was an American, and as a veteran had a US military ID card, he was a certified “enemy,” and one for whom the US government would not pay. That made him disposable. Again, no one knows, but these are plausible explanations for the inexplicable. With Tom’s death and the freeing of Jim Loney, Norman Kember and Harmeet Sooden, our www.freethecaptivesnow.org website morphed into a memorial and an archive, and we wound down our nightly vigil. I felt more than a little guilty about moving on, as the daily discipline of focusing on Iraq’s ongoing agony had hammered home in cruel detail how many thousands more men and women there were being kidnaped, held, tortured, and some killed, by factions from all sides, amid a bloody confusion of agendas. 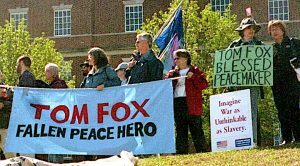 Before his first tour in Iraq, Tom lived for several months in a small cottage next to Hopewell Friends meeting, near Winchester, Virginia. After his death I visited Hopewell, and found his name still pinned to a bedroom door. 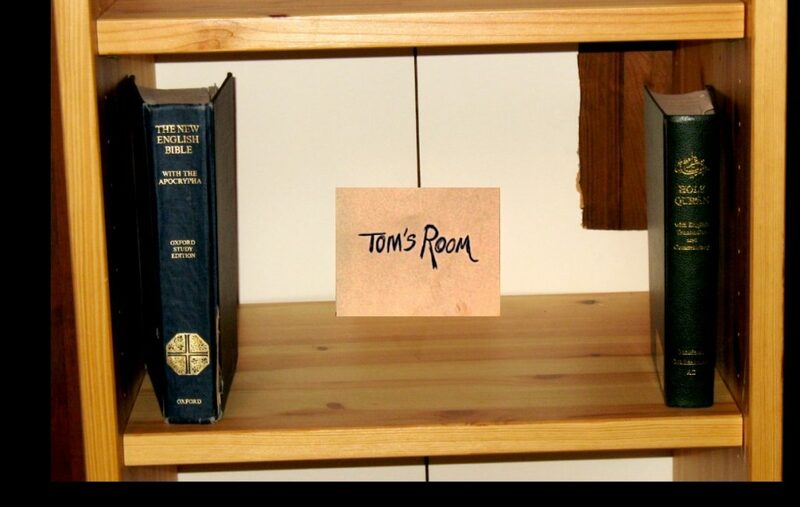 Inside was this bookshelf, with only the Bible and the Quran as bookends left of the many books Tom had once kept there. 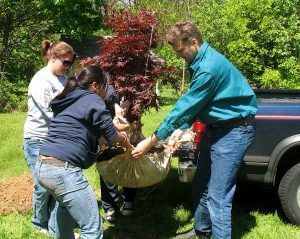 Younger Friends plant a Japanese maple in Tom’s memory near Hopewell Meeting. Yet Tom’s story does not stop there. In the founding saga from which his CPT team took its marching orders, death was a tragedy, but not the end of the drama. Further, Tom was a Quaker, and in this tradition, “be patterns, be examples,” and “let your life preach” are among our oldest and most venerable mandates. Moreover, in our yearly meeting, I had worked on religious education, particularly for adults. 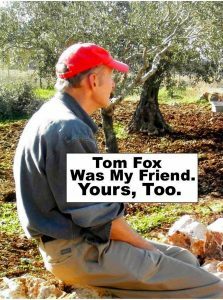 To this end, I compiled and published a small book, Tom Fox Was My Friend. Yours, Too. It was a memorial and a tribute, meant primarily for study and reflection. I believe Tom would recognize and approve such a project. Indeed, for the epigraph of his blog-journal, Tom used a paraphrase of the quote from which these mottos are taken. In the book’s pages, various persons reflected on passages from Tom’s writings, or their memories and impressions of him, and offer comments on the patterns and examples of this remarkable, foreshortened life. Can that also happen here? 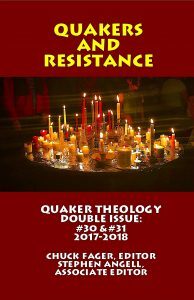 This true story is excerpted from the new double issue of Quaker Theology. More information about the issue is here.